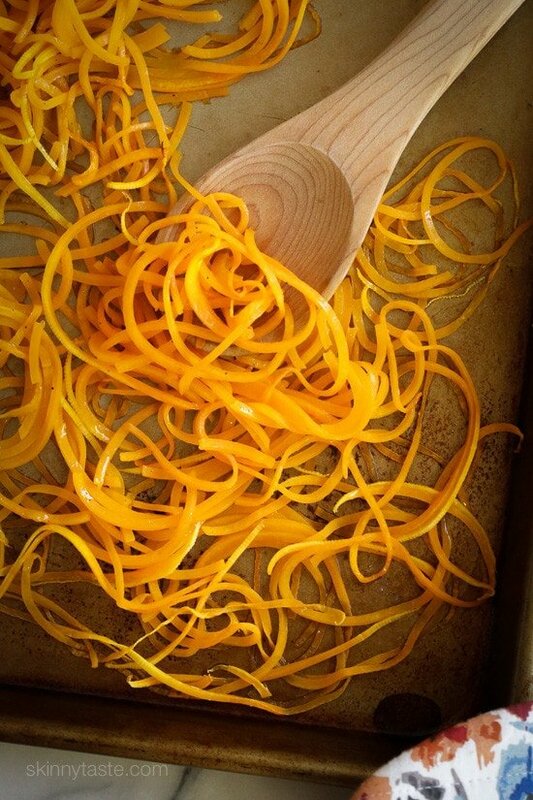 Roasted Spiralized Butternut Squash Noodles are a healthy pasta alternative or side dish that only takes about 10 minutes to roast in the oven. My husband doesn’t care for zucchini noodles, but is a huge fan of butternut, and therefore loves these noodles. The best part is they only take about 10 minutes to cook and they don’t get soggy like zucchini, although they do tend to get soft and break if you cook them too long. I prefer to use the thicker noodle blade (if you have the Inspiralizer, it’s blade D) and roast them in a single layer, so for this recipe I used two sheet pans. You can also cut them ahead on the weekend and keep them in ziplock bags in my fridge for the week to roast as needed. The top straighter part of the butternut is the only part that can be spiralized as the bottoms part with seeds is not solid and therefor it would not work. Save the bottom part for soup or another use. For this recipe you’ll need one large butternut for two people. The top part that gets spiralized should be about 20 ounces once trimmed and peeled. Preheat the oven to 400F. Lightly spray 2 large baking sheets with oil. 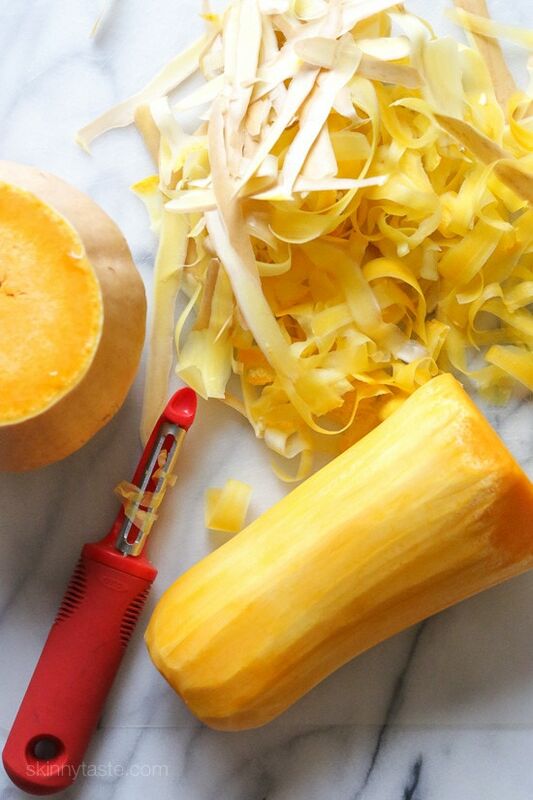 Trim the top portion of the butternut that can be spiralized reserving the bottom for another recipe. Trim the top off and peel the skin off. 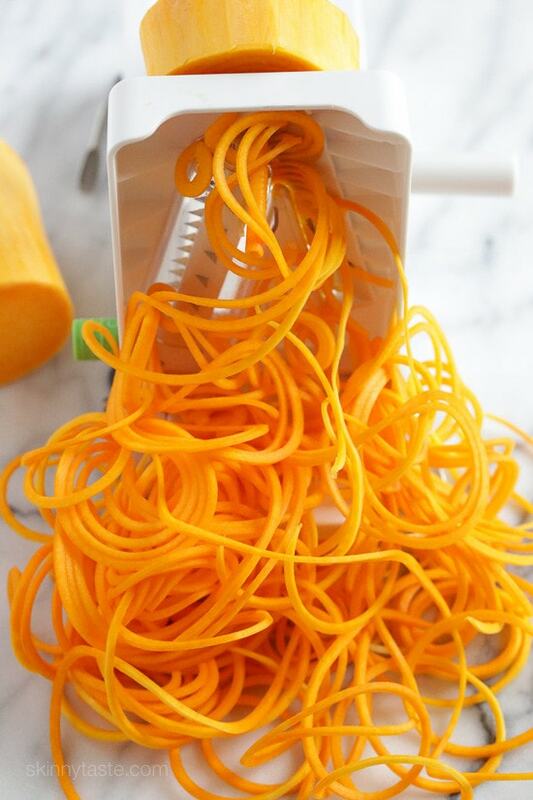 Cut the butternut in 2 pieces so it’s easier to handle, then spiralize using the thickest noodle setting of your spiralizer. Cut into 6 inch lengths so it’s easy to eat. Transfer to the prepared baking sheets and drizzle each with 1 teaspoon oil, 1/4 teaspoon salt and black pepper to taste. Roast until soft, 7 to 10 minutes. This was really good. After it was cooked, I sprinkled it lightly with some garlic powder. It really complimented the stroganoff with mashed potatoes. My husband even liked it , and he does not like squash. I bought some butternut squash noodles (pre cut) at the grocery store and found your recipe. They cooked perfectly and I sprinkled some goat cheese on top to finish it off and it was delicious. First time I ever heard my husband say butternut squash is good! Thanks for the recipe! For zucchini spaghetti, put in microwave (zucchini, squash and some carrot), microwave 3 minutes. Carrot give it some crunch the kids loved. We added Old Bay, Sea Salt, Cracked Pepper, and Spaghetti Sauce. No sogginess at all. I have a cheepie spiralizer cuz it was on clearance and very affordable. I had some trouble spiralizin butternut so microwaved it 4 min first. Made it easy to peel and trim. Got chewed up at the “tooth” end, but I trimmed it and tried again. Will try 3 min next time, but it worked well! Would you suggest eating these right away? Do they refrigerate well? Made these last night and woke up thinking about how good this was. May have to make it again today. These are so much better than zucchini noodles and the firmness makes this perfect to mix with meat. I cooked beef, onions, pepper in the skillet. Cooked the noodle then added some pesto sauce to them and topped them with the beef mixture. OMG it was so delicious. 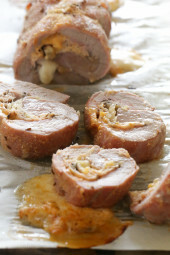 Okay, I have made up my mind and I am making this again tonight. I just had these “noodles” for lunch with some meat sauce my husband had made and they were so good! I think this is my new favourite pasta alternative! Just a question though… wouldn’t one serving be just 1 sp for the olive oil? I bought the spiralizer attachment for my kitchen aid mixer and I totally love it! Fits nicely in a slim box and hardly any clean up???? I made this dish and served it with your Thai Basil Chicken instead of rice and the combination was delicious. Unfortunately, I was not able to spiralize a butternut squash with my paterno spiralizer, it was just too hard. Gina do you think this would be good with your crockpot bolognese over it? 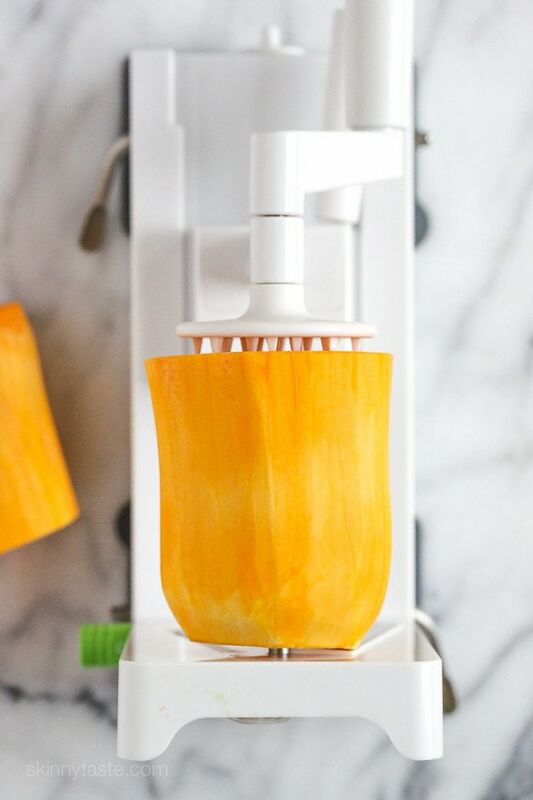 I have yet to try butternut squash with my sprializer. Thanks for this, definitely going to use this recipe when I try it! I'm curious about the SP values, wouldn't it be just 1 point per serving for the oil being used since butternut squash is zero points? Does anyone know if she bases her SP on the WW recipe builder or just uses the nutrition facts to calculate? I bet an Alfredo sauce would be great over these noodles. If you're concerned about fat or calories, make a low fat version using fat free half and half or even skim milk, but thickened with xanthan gum(must do this with a blender or food processor, or lumps)and some parmesean. there's even a fat free parmesean now, it's not bad, but weirdly, on pasta, I seem to inhale some and cough.I call my low fat alfredo sauce, afraido sauce, but it's actually good. You CAN Spiralise the bottom! Cut the top so you have exposed the seeds, and scoop it out, then use the flat blade from the spiralizer. It will make wide fat noodles like a Pappardelle. What a great idea. We make zucchini noodles all the time, but it had never occurred to me to try butternut squash. My spiralizer isn't quite as nice as the one you have pictured but it should still work. Thanks for the recipe! 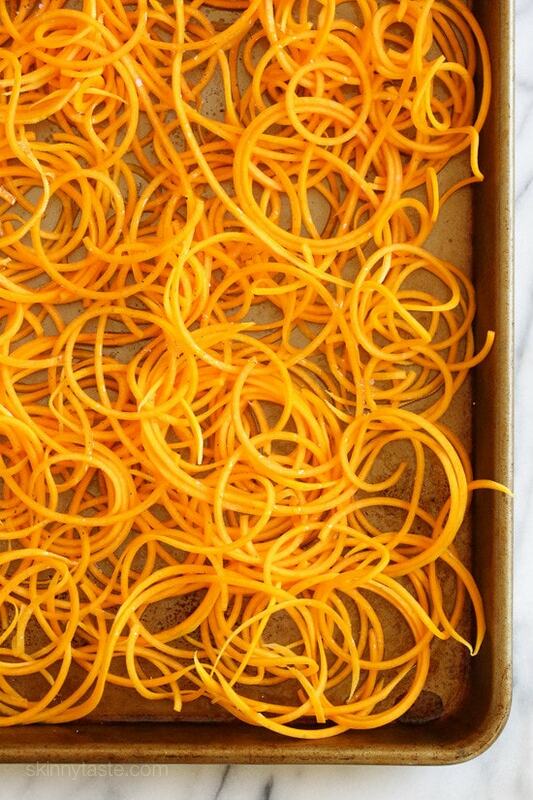 I haven't spiralized butternut squash yet, but that sounds so yum! 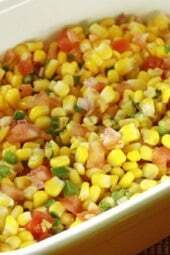 I made this tonight as a most delicious vegie side dish. Definitely a keeper recipe! Like zoodles, but loved this dish. One would never guess that it was butternut squash. Tasted almost like yams. We were ready to lick the serving dish clean! Thanks, Gina for all your delicious recipes! Gina, do you think the Skinny Bolognese sauce would work well in the Instant Pot? Never would have thought to put butternut squash in one of these, but the idea sounds perfect! I might even be able to get my husband to eat this stuff now! Thank you for the questions and response on which part of the squash to use for this recipe. I just got my first spiralizer and used it on this dish and it turned out great! Which spiralizer do you recommend – the Paderno or The Inspiralizer? You suggest to use only the top half of the squash. I am not sure what you mean by top. A butternut squash is pear shaped. Do you open it first and remove the seeds? From the recipe: "The top straighter part of the butternut is the only part that can be spiralized as the bottoms part with seeds is not solid and therefor it would not work. Save the bottom part for soup or another use." The top is where the stalk is or would be (it may already be mostly cut off before the squash is sold). Could use the round part to make Butternut Squash Fries. Just saw a recipe on Yummly posted by Divalicious. They look yummy and healthy. Gina, you used to recommend the Paderno brand spiralizer (which I then purchased) and now you are recommending this other brand. Which blade do we use on the Paderno brand to get this noodle? Thanks. I have the Paderno one and I use the larger noodle blade, I the smaller one they just got mushy. This looks great Gina. I purchased the Paderno one that Gina recommended. I'm excited to hear you are coming out with a new cookbook, can't wait till pre-orders are available. I bought three last time, one for me and two gifts. Hoping to also see more recipes using the zoodles!! !Thanks Gina!! What kind of spiralizer do you have? I linked above, it's the Inspitalizer on Amazon. I don't know which one you got but the " INSPIRALIZER" is far from junk. Granted Amazon does sell Junk Spiralizers I have gotten 2 but not the INSPIRALIZER THE SUCTION THAT KEEPS IT FROM SLIPPING is the best the dial a blade is the most best. It's easy clean an compact. I just got my daughter one. Can you tell I like it and use it about 4 or 5 times a week. I agree, the Inspiralizer is excellent and can't be beat. I had the Paderno and it's good but replaced it with the Inspiralizer and love it even more. I gave several for Christmas gifts and everyone who received one hasn't stopped raving. 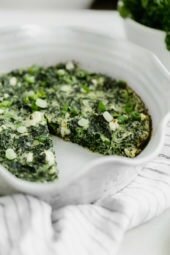 I also go to the Inspiralized site for recipes and can't recommend them enough. I am just a follower and don't receive any personal gain or know the person who is responsible for this amazing gadget but feel passionate enough to share my thoughts. I have the Paderno and LOVE it! I bought a cheap one just in case I didn't like it. I bought the 'oxo' spriralizer from Bed Bath & Beyond. I think it was $20 (Cdn) before the coupon. It's very compact. You rotate the vegetable with your hand and after spiralling a whole zucchini, you get pretty sore.